I love applesauce in all of its forms. Smooth, chunky, unsweetened, sweet, spiced, plain. I don’t think I’ve ever met an applesauce I didn’t enjoy. 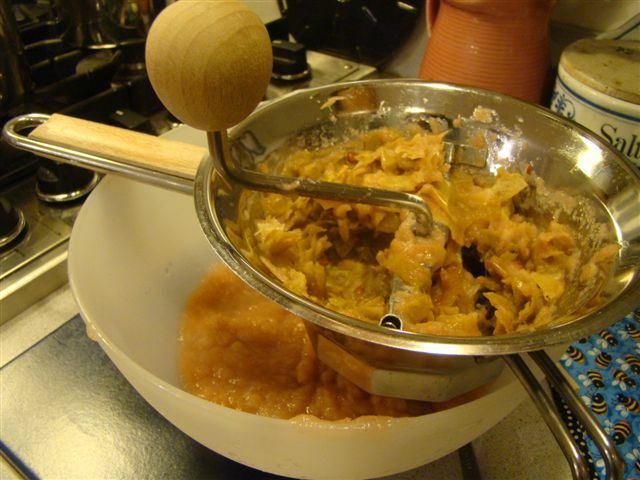 That means I was excited about this week’s recipe for French Fridays with Dorie, Compote de Pommes Two Ways, which is the French way of saying applesauce with two options for the final products, thin or ultra-thick. I consider myself to be a frugal cook. I don’t mean I’m a cheap cook. I have no problem buying the best quality ingredients or indulging in an unusual ingredient. I just mean I like to make the most of my ingredients. This often means I try to do “nose-to-tail” cooking with whatever I can, including fruits and vegetables. I loved that this recipe started with chopped-up whole apples, skin, cores, seeds, and all. In fact, when I make an apple-intensive dessert like apple crisp, I often make applesauce from the skins and cores alone. It’s amazing how much applesauce the scraps yield. Last weekend, I made a couple of apple pies for a fundraising event for the new Community Farm I’m involved with. I dutifully saved the peels and cores for applesauce. I also ended up with a few cups of extra sliced apples that had already been tossed with sugar and spices. When I was ready to make my Compote de Pommes, it occurred to me that rather than weighing out whole apples from the drawer, I should see how much apple parts were leftover from the pie making project. Lo and behold, I had about the two pounds the compote started with. So, that’s what I used as my base. The apple cooks with a little brown sugar and a small amount of water until the apple is mashably tender. Then everything takes a trip through the food mill. For way #1, you can season this “first press” and call it a day. I was more intrigued by way #2 where the applesauce cooks down further to because thick and spreadable. You can do this stovetop, but I chose the oven option, placing the pot in a low oven and stirring it every 10 minutes until it reached the desired consistency. After about 50 minutes, it was bedtime, so I decided it was thick enough. If I’d had the time and patience that evening, it could have cooked for even longer. Finally, the compote de pommes can be sweetened to taste (mine didn’t need it), a generous spoonful of vanilla extract, and a small chunk of butter. I’ve never had applesauce flavored with vanilla, but it was a happy discovery! Dorie gave various suggestions for serving the compote de pommes. I found it delicious slightly warm, just eaten straight from a bowl. I also remembered making a French Apple Tart earlier this year when I was participating in Tuesdays with Dorie. This is a simple construction of a pastry shell topped with thick applesauce and sliced apples brushed with butter and sprinkled with sugar. I had some extra pastry dough in the fridge from the pie making, enough to make a 9-inch tart shell, so that’s what I did. I enjoyed it as much this time as when I made it originally. In my book (Howard wouldn’t try it), I’m declaring Compote de Pommes a winner this week! To see what the other Doristas thought, follow their links here. I can’t find the recipe online and we don’t post recipes that aren’t already out there, but We don’t post the recipes, but you can find it in Dorie Greenspan’s book Around My French Table. Posted on 8 November 2013, in apples, Autumn, French Fridays with Dorie and tagged apples, applesauce, French Fridays with Dorie. Bookmark the permalink. 19 Comments. Your tart looks amazing! I can’t imagine not loving it! I made mine without the mill – maybe I will have to get into that. I’m kind of like you, and now I find myself feeling a little guilty about all of the waste from just peeling and coring. Oh well, another day! I’ll have to try the option #2 next time just so I can have apple jam for my muffins in the morning! You are a Yankee girl after my own heart. I didn’t know you can get a decent amount of sauce out of just the peels and cores. I am going to try that the next time we make pie. 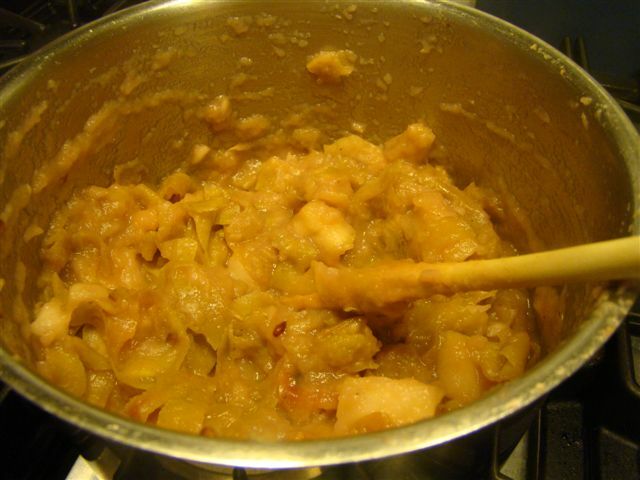 I never knew you could make apple sauce from the remnants of peeled apples. I love that there was no waste. Your tart is gorgeous…great way to use that apple sauce! I bet it’s getting cold in your neck of the woods…today we were in the 30’s. I guess I shouldn’t be surprised…we are in November already! Have a great weekend, Betsy! My goodness, you go, girl. I felt a bit guilty after reading your Post. I need to work harder at making the most out of my ingredients. Although I always share what I cook, make and bake, I still waste too much food. Like Kathy, I had no idea applesauce could be made out of leftovers. I also loved this week’s recipe – there’s not much about applecause I don’t like – and will make this often. As you pointed out, there are so many different ways to use it. The vanilla did make a difference. Nice difference. I left mine chunky, better for the turnovers. Wow, way to go! Dorie would be so proud of you, making applesauce and then that stunning tart out of apple scraps. I too get a perverse pleasure out of using everything up, but until I invest in a food mill (I’m mighty jealous) my apple sauce is going to have to be made with cored apples. Love all that you prepared but that tart in particular is just stunning. Wow indeed. Sorry to hear that Howard was not interested but I think you lucked out this week a la the “more for you” mantra. I am also so impressed with your frugal kitchen philosophy and aspire to be better in this area myself. Right now my efficient use of extras involves the Westie but I will not add more details or fear reporting to PETA. Suffice to say the beast is healthy and HAPPY :) Also enjoyed the link about the Lexington CSA- thanks for sharing ! That apple tart looks so good (I remember that one too!). I totally didn’t realise you didn’t have to peel and core the apples before you cooked them! Betsy, looking delicious – I really like that you made the apple tart as well as the apple compote. That wonderful tart that we baked for the Tuesdays with Dorie group a few months ago – the thought had crossed my mind to make one as well, but, alas, I was way too busy this weekend preparing my post for tomorrow´s holiday. Although I was a day late posting, we really enjoyed the apple compote as well! Love your post, I would definitely look more closely on ways to make the most of what we use and throw! Love love your apple tart, AweSomE! I like your cooking philosophy Betsy. We could all use our ingredients more completely! I don’t have a food mill but now I’m thinking I need one. Thank you for your kind words regarding the loss of my friend. She was my bestie for 37 years. I’m feeling your hug and it helps! Thank you. 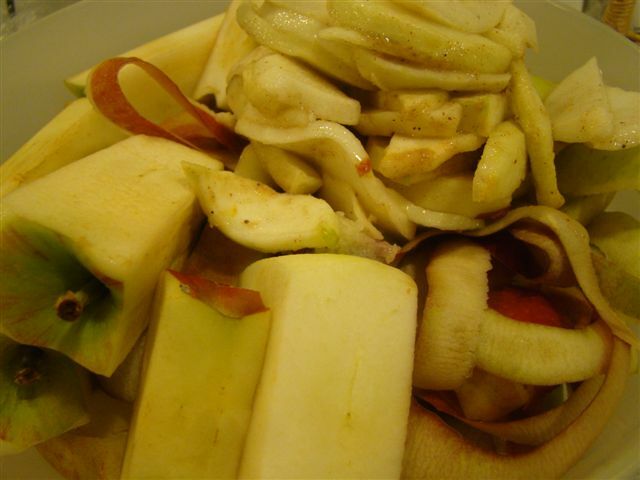 I had no idea you could make applesauce from the scraps – thanks for the tip! 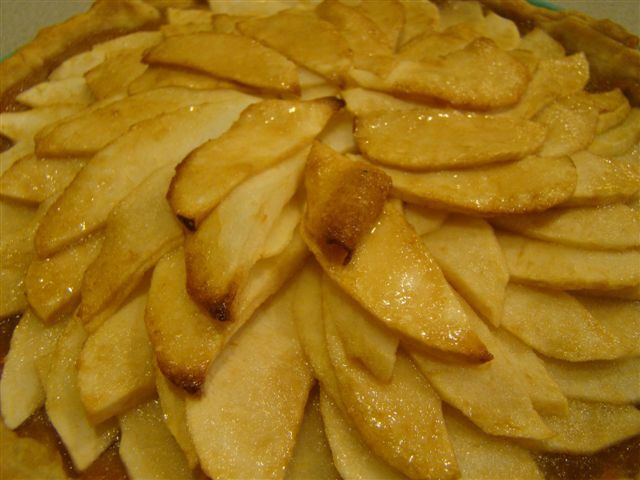 Your apple tart looks fantastic! Bonus that you could use the scraps from pie making for this sauce. Your pie looks sensational! How interesting! I never would’ve guessed the scraps have enough apple left to make sauce. I’ll have to try that sometime. Your post made me want to try the second version. It sounds easier in the oven. Maybe with the rest of my CSA apples. I think the distinction between frugal and cheap is an important one. It’s amazing how much you got out of the scraps from pie-making. I was happy to see a post from someone who did the second method. It looks really good. Your apple tart is gorgeous, as well.